Previously an odd one out in our collection. This is a 12 wheeled sleeper to an LMS design, but actually built by BR at Wolverton in 1951, making it amongst the last 12 wheeled coaches to be built for use on Britains railways. These carriages can only be described as huge! With 12 first class sleeping compartments and attendents lobby this coach would have run on the West Coast Main Line during its relatively short time in service - it was withdrawn in 1972, having been replaced by mark 1 sleepers. It then entered departmental service (as 975183) as saw another 10 years use as engineers accomodation. Then purchased by RVP it moved to Loughborough to provide volunteer accomodation - in which role it continued for another 10 years. 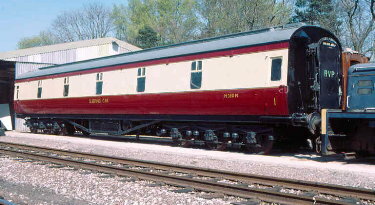 In 1996 it entered Rothley shed for major bodywork, including complete reskinning and repaint in Blood and Custard livery. The externally restored vehicle was then used in some special events and phot charters. The intention was then to refit the interior - either to original condition or conversion to a camping coach. Unfortunately this stalled with a shift in emphasis to the LNER stock, and the need for regular volunteer accomodation has declined. Threfore we sold the vehicle to Trailways Ltd who moved it to Louth in 2006. The intention being to restore it for static accomodation. See the links page for a link to their website.